This is exciting! Booths Garden Studios are just putting the finishing touches to the design of a low maintenance garden annexe/granny annexe building which they are calling the MyePad QCB. Self-contained annexes in the garden are becoming hugely popular, providing a home for a relative – young or old or as guest accommodation or a home for a nanny. 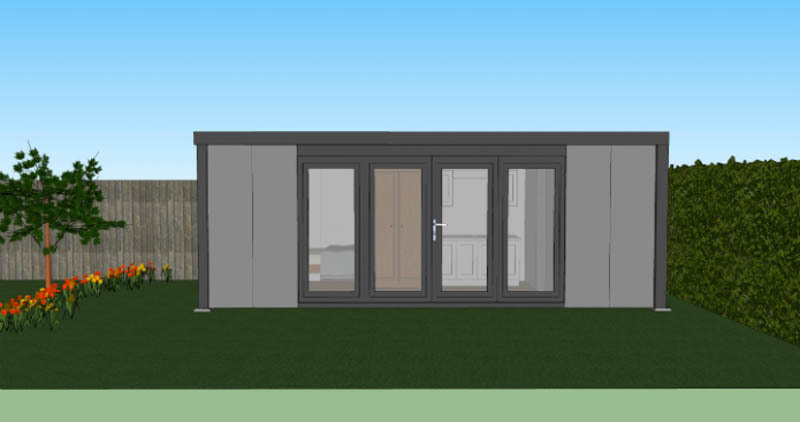 Many companies offer garden annexe buildings, but three things excite us about this new design by Booths Garden Studios: it will need virtually no maintenance, it can be built without planning permission and the price. Normally to build a self-contained home in the garden, a planning application has to be made and the building must comply with Building Regulations. Booths Garden Studios have built many granny annexe buildings that comply with these rules. What is different with their MyePad QCB range is that complies fully with the Caravans Act. This allows certain residential buildings to be built without planning permission. To comply with the Caravan Act, Booths Garden Studios have had to design a building that can be removed from the site in one or two sections by crane – it literally has to be a mobile home. The Act also lays out size restrictions that the Booths designers have had to comply with. To comply with these rules the Booths team have created a 6.35m wide by 2.69m deep building, in feet and inches, that’s 20ft 10inch by 8ft 10inches. This creates an internal footprint of 6.1m x 2.44m / 20ft x 8ft. This space is by no means huge, but the clever design has created a fully functional home within it. The layout includes a single bedroom with room for a comfy chair, a kitchenette with space for a table and chairs and a fully functional shower room. The floor to ceiling glazing that runs along the front elevation will flood both the sleeping and living area with natural light and creates a great connection with the garden. The price for the MyePad range hasn’t been firmed up yet, but the Booths team have indicated that it will come in at less than £25,000. You have to factor in groundwork costs for the connection of the electric, water and waste to your homes mains supply. The cost of these works is very site-specific, but the Booths team suggest that if you allow £5,000 for groundworks, the complete project could come in at £30,000. When you consider the comparative costs of buying a studio apartment or the fact that some people pay £30,000+ for a garden room for use as a hobby space, this is a bargain for a home that can be used 365 days a year. Booths Garden Studios are the kings of the zero maintenance garden room, they have applied these principles to the MyePad range. Finished externally with durable, colour coated steel cladding and uPVC doors and trims, you’ll have little more than cleaning the windows to commit too, maintenance wise. Do you have questions about the MyePad annexe? Iain from Booths Garden Studios has answered a handful of common questions about the new MyePad range on their website. He will also happily answer any questions you have if you care to ring or email him. We look forward to showcasing the first examples of the complete MyePad QCB garden annexes soon! In the meantime, talk to the Booths Garden Studios team on 07590 067 120 or drop Iain an email: [email protected] To read more about the MyePad take a look at this page.